As I once had in my CN signature: “No such thing as a boring planet; [**] only the observer perception-lacking” and would add to that: [*...or [no] boring side of a planet.....*]. In fact would extend that further to what we observe in general! Regardless: so good to get back to the scope after a long-spell (seemed like) of stormy weather and other unproductive diversions. Edited by David Gray, 18 March 2019 - 10:37 AM. That's a sketch? You have some true talent! I'm surprised the seeing was so good, with the roaring jetstream last night. Was it consistently good, or just now and again? Tho' if 06:00 a.m. is still showing: hardly raging, that narrow approaching band. I had some ‘weird’ and wonderful conditions with tight doubles in mid-Feb under a hopeless looking jet’. Basically vigorously-scrambled Airy rings and crisp central disks – the apodizer a definite factor with that I could see. Edited by David Gray, 18 March 2019 - 11:02 AM. 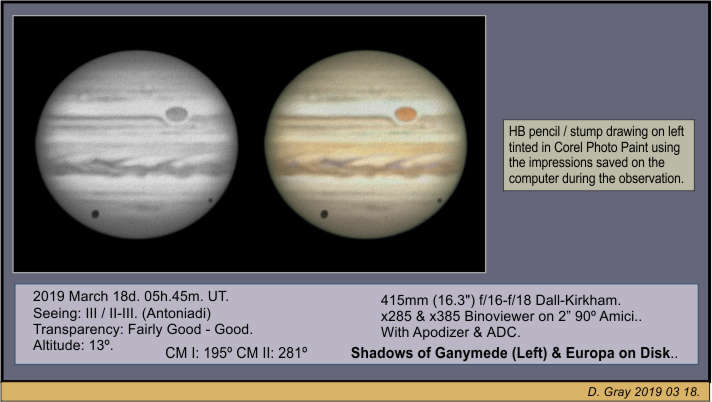 Very nice sketch of Jupiter: Double Shadow Transit . I like this double transit sketch of Jupiter and the GRS. The sets of belt-lets in the S temp region are impressive, they are so low in contrast that it usually takes very good conditions for me to see them. I'm also liking your amber EZ 'belt', and your burgundy NEZ barges. Nice colours! Regarding the seeing, I have given up looking at the jetstream, and the weather maps, I just tend to get outside and take whatever is there now. Trying to get those hues on planets sort of became my main aim (sort of! ); pretty much overriding seeking the very finest detail which became ingrained over the years – at the cost-of that even. Before the ADC I was bracing myself to the prospect of the planets getting very low here and the atmospheric dispersion working against getting ‘colour-accuracy’ – a minefield at best.........As I said after trialing it “I’m a happy bunny”. I’m similar-minded to you about forecasts and such: my continuing referring to jetstream forecasts etc. is now more in the vein of evaluating predicted/indicated vs observed. As to those sites giving seeing forecasts......well.......no chance of me bookmarking those. If I had not the scope on hand practically ready to use at a moment’s notice I expect I would have a grudging reliance on the various predictions before committing to a lengthy journey. But I have to say I’m pretty sure my observing files would be reduced by some 30% or a deal more had I took forecasts at their word and not even bothered to look. In short I take a look and, depending on hunches, linger awhile or just keep checking regardless. Have to say tho’ that the weather forecasts have been surprisingly near the mark so far this year – maybe they’re using a better batch of seaweed...... .
*Impressive* take on the King. Always love those shadow transits. The GRS is noticeably smaller, isn't it? Still haven't had my first look this apparition (except naked eye). Rare clear mornings have been accompanied by near gale force winds and temps in the negative Celsius numbers. Now that we're past the equinox maybe things will improve. It's always a pleasure to see your work Dave, thank you so much to share it here! Been stormy here up to last weekend. Now we are back to that more clement – tho’ cloudy – weather we had in February; but what we have now is more in keeping with the month of March: *Coming in like a lion* and possibly *Going out like a lamb*! Yes the GRS is smaller now and for some time: now and then I chance upon some sketches from the 60s to 80s/90s and initially/subconsciously I cringe with the thought that I’ve drawn it way too large..... but hopefully not! This is one of my favs of yours now. As Chris mentioned the low contrast belts in the Southern region giving it that layer-cake look is really a fine touch. On the best nights I've seen the "cake" too, a beautiful effect. Alas, quite long ago when the position in the ecliptic had it high up with summers good seeing at the proper hour. LOL, I don't think you are Red Spot Obsessive - I get it. You take what you can get when the getting good, or even possible. Don't we run into the same issue with Mars sometimes where weather through out a season by chance leaves one hemisphere visible simply because it was clear those nights? As I said this is one of my new favs of yours , the serendipity of the moon shadows, the color of the red spot and fine, thin, low contrast belts and zones with the SEB being textured but lower contrast than past years. Yeah I like it. And Chris, glad to see you in the thread. Red Spot obsessives: BAA Jupiter Director John Rogers once expressed his frustrations about those to David Graham and me some 30-yrs ago; there may still be more than a few out there methinks. Dave, where IS that 10? Mothballed and stowed upstairs these past 40+ years Pete. Looking like a clear morning tomorrow with calming wind and again the GRS coming onto the globe – maybe I’ll try for Saturn: currently only just keeping ahead of dawn’s light. Edited by David Gray, 24 March 2019 - 04:22 PM.